Used Audi A4 Review - 2005-2009 | What Car? 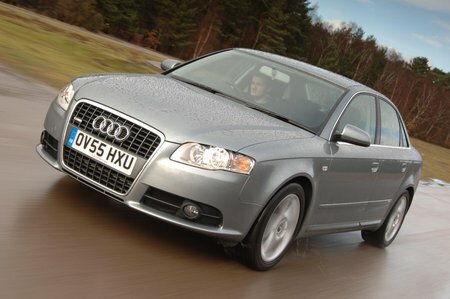 What's the used Audi A4 saloon like? Despite looking like an all-new car, this Audi A4 saloon is actually a heavily revised version of its predecessor. It's slightly bigger inside, but dynamically very similar. With precise handling and good roadholding, the Audi is entertaining to drive, and unsettled by only the bumpiest surfaces. It grips well and turns into corners crisply, and rides comfortably over most surfaces. Although the Audi ultimately falls short of the BMW 3 Series for driver enjoyment, it's perfectly acceptable. This A4 retains Audi's tradition for clarity, quality and comfort inside the cabin. Controls are logically laid out and feel durable, and four people can sit in comfort. However, five will struggle due to the bulk of the transmission tunnel. Wind and tyre noise are kept in check.